Since this will NOT be in the final TAGAP2, I might as well let this joke out of the bag. As you can see this wasn't so much a joke but a final tribute to something I literary grew up with. 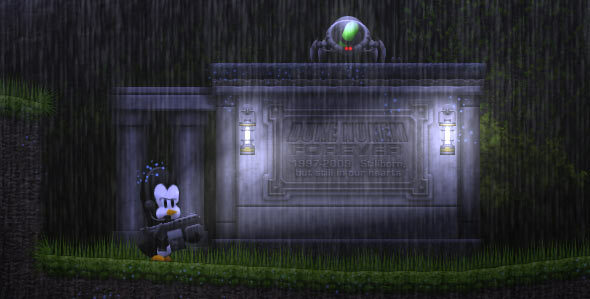 Back when the death of 3D Realms as development house was announced – with the presumed death of Duke Nukem Forever – I was working on a level of which a portion takes place on a graveyard. So, since my most anticipated game project had seemingly just died, I decided to put a mausoleum there. The plague sais: "Duke Nukem Forever 1997-2009: Stillborn and still in our hearts"
Who will inherit the mausoleum, then? We'll see. Work on final boss fight continues. Hence saying anything more on it would be a cargo train full of spoilers, I'll leave it at that. I can say, however, that this one will take a while and justifiably so. And we're about half way through the creation of the sequence. Also currently in progress are joypad tweaks. Ensuring all menus are easy and intuitive to navigate is a must; Transforming 100% mouse-based point-and-click interface into console-style menu and making in work in tandem with mouse controls was trickier than I initially thought, but now it works swell. These joypad improvements also carry over to the gameplay. In addition to the standard 'next/previous weapon' weapon selection (D-Pad up and down), there are two customizable 'weapon favorite' buttons (D-Pad left and right). You can assign any weapon you want to these two and select them by a quick tap. Assigning weapon to the buttons is as easy as selecting the weapon you want to mark as favorite and holding down the favorite button down for a second instead of a quick tap. And of course these favorite buttons work the same for keyboard/mouse input as well. Recently Petja played me the first draft version of TAGAP 2 end credits song. Yes, you read that one right; There will be an end credits song – as in 'with vocals'. Petja has already cooked up a demo version and it'll be great way to end TAGAP 2. Speaking of sound department, Petja just went on with purchasing brand new recording gear; Studio mic, pre-amps, the whole package. On Monday this we did some test recordings and the voice quality is superb. We are very likely going to re-record every single voiceover of Pablo and Pedro sometime in near future – and finally record the voice of Primo as well. In addition to the latest DVD releases I've been going through The Big Finish audio dramas as well as the boxed set of Tom Baker's first full cast audio drama The Hornet's Nest. The latter has been available as separate releases for some time, but it's now available in one big box, aptly just when I've started to consume Doctor in audio-only form. The Big Finish dramas are truly starting to show their true nature and it's a beauty. Without spoilers, in a nut shell; With slight nudges, the first ten or so the 8th Doctor stories form a huge story arc, a bit like the current series does. Only these are, well, more epic, subtly leaking into stories of other Doctors as well. It all culminates into the play that is next in line, Zagreus. "He who sits inside your head, who lives among the dead, who sees you in your bed, and eats you when you're sleeping", indeed. Can't wait for what's next! By the way, if you ever wondered how badly I've gone bonkers over Doctor Who? Well, badly enough to end up as Fan of the Month on WhovianNet, one of the biggest Who-hubs on the Net. And that's it for now; Primo calls!